As his design unfolded, Rohrer realized how different his treatment of death was from other videogames. In Passage, your character's inevitable death wraps up the story in much the same way our own stories eventually conclude. Most videogames, however, use death to impede the narrative in service of the gameplay. Rohrer sees that as problematic. "When designers are trying to tell this whole long, linear story, and the whole point is to deliver the story to you ... death is a sort of stumbling block as opposed to a dramatic device like in a movie," he said in a telephone interview. Rohrer envisions gaming as a medium that provides full narratives without the interruption of death. He points to another indie title, FaÃ§ade, in which the player intrudes on a couple's soured relationship. Some actions grind the conversation to a halt, while others perpetuate it, but either way the game provides a self-contained, complete experience. In Karoshi, and its sequel, Karoshi 2.0, death is actually the goal. Each level of this free-to-download platformer requires the main character to kill himself by landing on spikes, leaping in front of bullets or standing under falling blocks, solving puzzles to unleash each death trap. There's an awkward satisfaction to jumping into the pit with purpose, and the punishment for failure is, in turn, much darker. 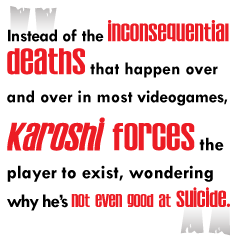 Instead of the inconsequential deaths that happen over and over in most videogames, Karoshi forces the player to exist, wondering why he's not even good at suicide. Despite his work, Karoshi's developer, Jesse Venbrux, accepts the convention of death as punishment in videogames. Death is a good way to let players fail, he said, though he'd like to see more artistic games reach the market. But Venbrux does fancy himself a rule breaker, and after Karoshi, he once again gravitated toward the subject of death. Execution orders the player to kill a bound, unarmed man. In a macabre twist, restarting the game after pulling the trigger doesn't revive the corpse. "I guess 'death' is a good subject because it's in almost every game, but it's also a very serious thing," he wrote in an internet conversation. Neither Karoshi nor Passage are notably violent games, and given the number of shoot-'em-ups and slashers that occupy store shelves, it wouldn't be fair to leave violent games out of the discussion. Is it possible, then, to have a game that offers combat but avoids the familiar conventions of save points and respawns?